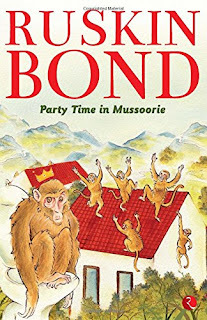 Monkey on the Roof is a typical Ruskin Bond story, like about nothing but looks everything. The story features Ruskin Bond or say shows how he lives in Mussoorie at the cottage with an adopted family. Initially, he talks about animals and birds and insects that break into his cottage or onto his study table. He never harasses or chases them mercilessly; rather he drives them away from his window which opens to the mountain side, where he stands for hours watching the people on up road, school children and troublesome monkeys. He says that his roof is made of tin, old fashioned, where monkeys often make noise and if there are no monkeys, then its cats vs. rats at night. Ruskin finds obstacles to his sleep; he loves sleeping and admits that he is a lazy writer. If freedom was given, he would have his stories written by his assistants. In the story he also tells about his obsession for bed tea and breakfast. Ruskin puts strong emphasis on having good breakfast ever since his young days. He loves to have a well-proportioned breakfast. On breakfast and tea, Ruskin narrates two anecdotes; one is that he used to get tea by an ex-convict in Dehradun while living on rent. And another one was of a Jewish lady in 1950, she used to bring nice breakfast for him, she was also her landlady. At the time of this story Ruskin was seventy. The best feature about Ruskin is that he tries to find meaning in nothingness that’s why he writes simple and most relatable stories. He finds a story in an ant that traverses across his study table. Well, other than its-bits, in this story you will find the Himalayan theme. One prominent aspect that runs like banter in his stories is the culture of hilly people. You cannot take away that from him. Recommended for light read.